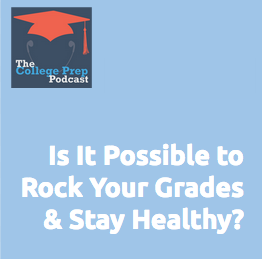 070: Rock Your Grades and Stay Healthy in College! So many students sacrifice their health for good grades, but today’s guest Clarissa Rodriguez says this isn’t necessary! After teetering on the edge of an eating disorder AND being told by her biology instructor that she doesn’t have what it takes, college student Clarissa Rodriguez turned her life around. Now she has graduated with great grades from nursing school, and teaches college-age young women how to stay healthy in school while rocking her grades. During our interview, Clarissa mentioned a number of free resources to help college students. Check out her free cramsheets to all things healthy in college, her blog (which Gretchen goes to for resources, too), videos about how to budget and live healthy as a college student, and free workouts for students that are easy to do in the gym or dorm room. Clarissa Rodriguez is a busy nurse, blogger, and health advocate for college-age women who want to rock their studies while maintaining balance in their lives. You can find her over at GirlBudgetLife.com. « 069: Are the Changes to the SAT Bad for Your Score?